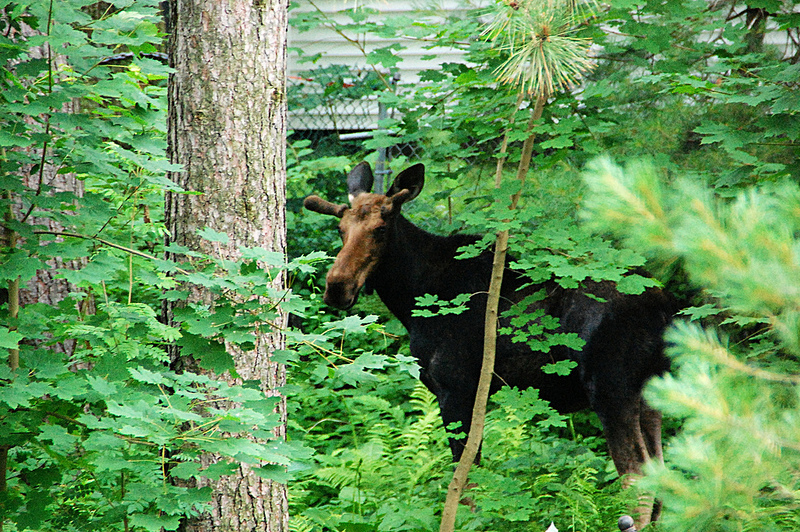 This is New Hampshire, of course, so seeing a moose isn’t necessarily that surprising. But Hidden Farm is in a more developed part of the state – a feel not unlike where Sonya and I grew up in suburban Chicago. Downtown is just a few blocks in one direction; an interstate is not far off in another. And there’s a convenience mart just on the other side of our fence. Moose are plentiful in the northern part of our state – down here, not so much, the main reason why I had yet to see a single moose in my more than a decade in the state. Still, there it was, looking as comfortable in our backyard as it might in the woods of the North Country. And that, we thought, would be that, so we went about the rest of our morning, buying groceries, running errands, and so on. Two hours later, we came back to our house. So did one of the moose. “Oh my God, he’s back,” Sonya said as she pulled the car into the driveway. The moose was nearly the size of our car, and he probably wasn’t even full grown yet. Once again, he looked perfectly comfortable poking around the corner of the yard – nibbling on a branch or two, sniffing here and there, looking around…. I snuck into the house to get our camera while Sonya and Owen got out of the car slowly to get a good look at our visitor. It’s extremely important to note that we kept our distance – this moose was big, strong and very out of its element; you don’t just waltz up to it and offer it snacks. We were many yards away at all times, and always had an “exit strategy” to get to the car or house if it had started moving toward us. 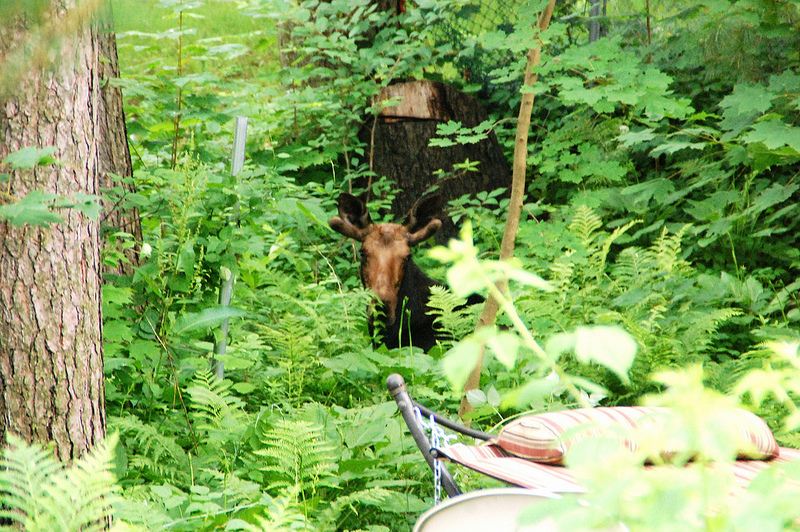 Fortunately nothing of that sort happened; not only did the moose move slowly and calmly, he actually sat down for a while in the yard, before eventually sauntering back off. It looked as if the entire neighborhood had been on moose patrol – there were people walking, jogging and biking down our street with digital cameras, hoping to get a good view. And more power to them, but I’m pretty sure we got as good a view as any of them. And that was just day one of the weekend! 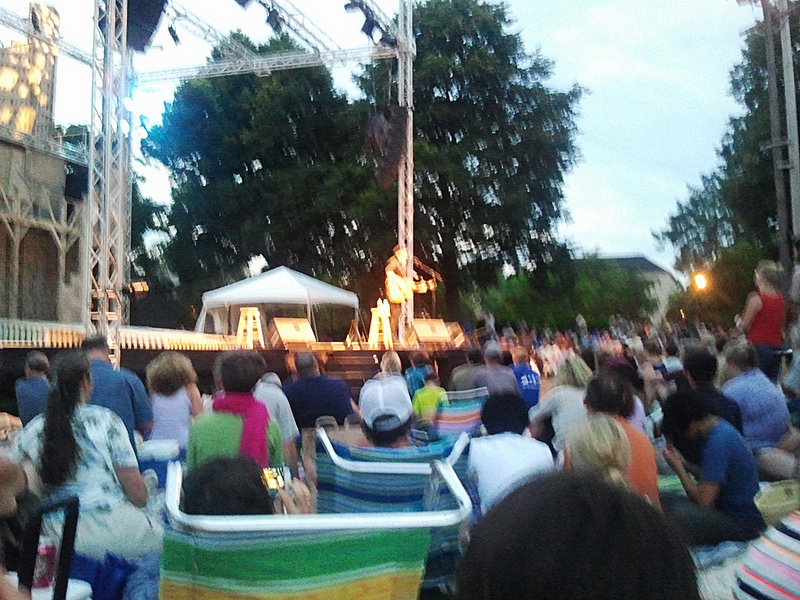 For Sunday Owen and I took a road trip to Portsmouth, to see one of our favorite singers, Richard Thompson, play at the Prescott Park Arts Festival. 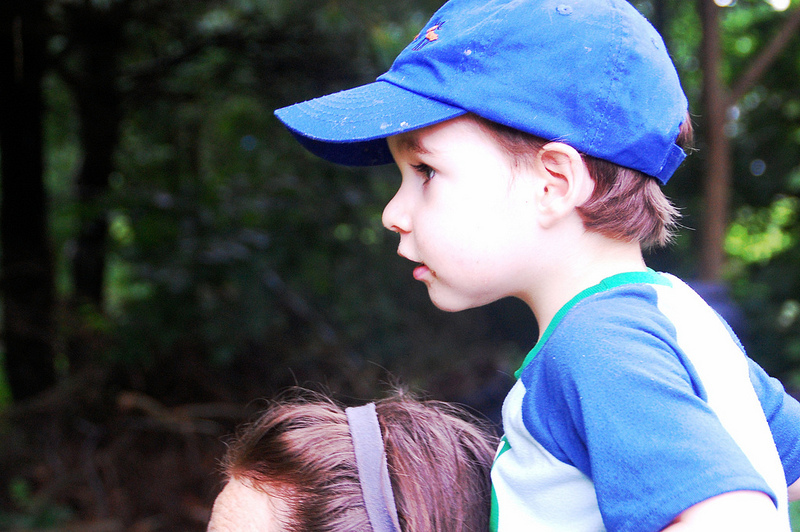 Typically one parent rides in the back with Owen, just to handle the housekeeping tasks that come with a two year old, but with Sonya opting to stay home, O was going to have to step up on the car ride out – and he did, mostly. He busied himself with some Crayola markers and a pad of paper, drawing up a storm… until he fell asleep in mid-picture, resting the open brown marker on the front of his new khaki shorts. But other than the two big brown inky splotches, the trip was a complete success. We stopped for lunch at a Mediterranean-style wrap place in town, which was quite good – there was a “kid’s corner” in the back, no doubt set up more for the other patrons than for kids, but still well-stocked with crayons, coloring sheets and board books. O impressed the woman behind the counter by eating a lot of his falafel, chatting with her about the moose and then reading a retelling of “Twinkle Twinkle Little Star” with me at the table, without once fussing or being difficult. The woman walked by at one point, patted me on the arm and said “you’re such a good dad.” Awww. 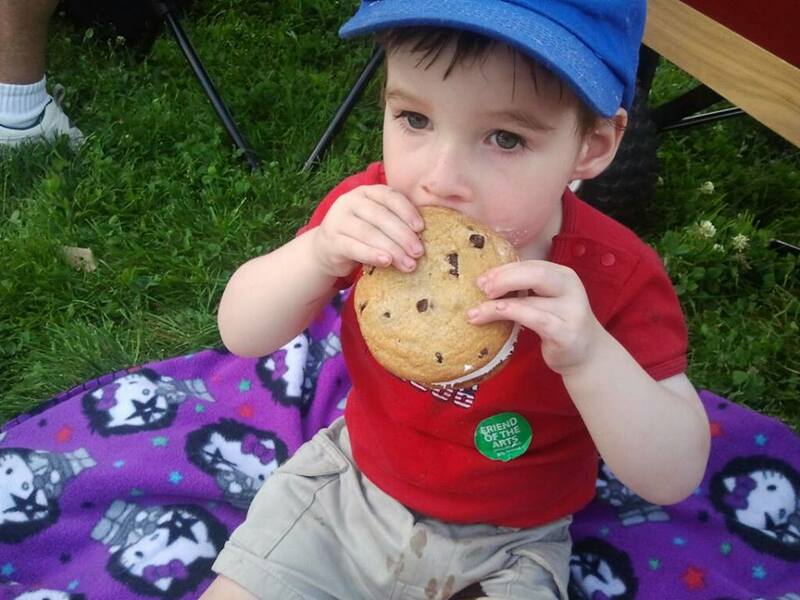 While all of this was going on, Owen and I decided to get a little snack from the concession stand – and “little” is a relative term here, because the ice cream sandwich was about as big as his head. 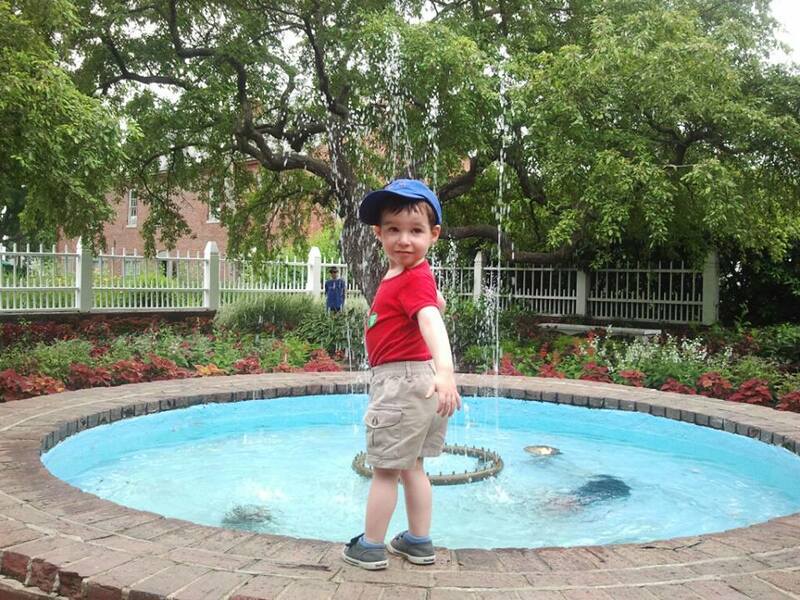 Last year, when all three of us came to Prescott Park to see Lucinda Williams, we bought an ice cream sandwich to share – only the barely a year old Owen wanted the whole thing for himself. This year I figured he’d eat as much as he wanted and I’d get the rest – which is exactly what happened, only he ate more than half of the thing. Thanks, I guess, for helping me avoid extra calories?